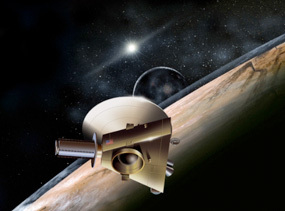 The Student Dust Counter (SDC) flies aboard the New Horizons mission, a NASA mission to Pluto and the Kuiper Belt. A dust counter is an instrument that counts particles of dust in space; the SDC collects this information when grains of dust hit the instrument as it travels to Pluto. SDC is unusual for two reasons: (1) It was built by students—for more information, see Our Student Team—and (2) it will collect dust twice as far away as the previous farthest mission (Pioneer). The SDC will travel out into the solar system 40 times the distance from the Earth to the sun, or 40 astronomical units. On October 10, 2010, the SDC became a record-holding dust counter, surpassing the previous record when it flew beyond 18 astronomical units.